inPhoto ID PS is the application for identification photo preparation which also includes Canon PowerShot camera control functions. It works with some modern models of Canon PowerShot digital cameras allowing to control them from PC remotely and to perform ID photo preparation based on captured images. Exclusive and only one solution for remote capture and control of Canon PowerShot modern compact digital cameras. Fine quality and full control of camera settings. 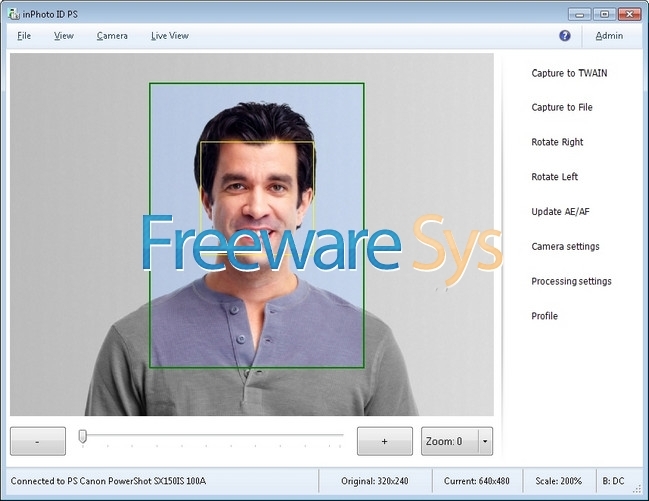 Crop frame on live preview simplifies and speeds up the process of making ID photos. TWAIN interface support extends your other applications to work with your Canon PowerShot camera. With the inPhoto ID PS TWAIN driver all the supported Canon PowerShot cameras are directly controlled from all the TWAIN compatible applications. The images are captured directly to the third-party applications without a need to save intermediate file or to use the clipboard. The processes of batch photo processing, identification card preparation, and facial recognition now become much easier and more productive with the inPhoto ID PS TWAIN driver. Intuitive, straightforward, and user friendly interface. inPhoto ID PS identification photography and camera control software is easy to learn and use. All the controls you need to capture images are located on the single screen. Familiar functions you have used working with a camera. inPhoto ID PS has the same names of the functions of Canon PowerShot Camera. You will have to spend no time learning how to use remote control of your camera via inPhoto ID PS application. Face detection algorithm works without a noticeable delay. Reliable, professional, and on-time technical support. Stable, extensively tested, and continuously improved product. This version does not support tool als test cameras.